Michael Conlan landing a right on Vladimir Nikitin. 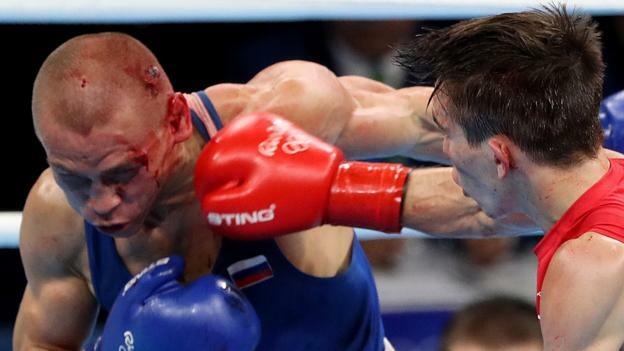 As Russian boxer Vladimir Nikitin and Irish boxer Michael Conlan prepared for the start of the quarterfinal bantamweight bout at the Rio Olympics, the announcers set the stage with perceptive foreshadowing. Yes, the announcers on the broadcast feed I watched were Irish. In the first round, Conlan, in red, was quick, aggressive going both to the body and the head. Nikitin, in blue, appeared to me to land several successful blows to Conlan’s head. Prior to that Conlan was getting a few shots to the left side of Nikitin’s head, and you could see a welt getting redder on Nikitin’s close-cropped scalp. Apparently that had been opened up in the previous bout with the Thai boxer. At one point, the judge stopped the fight to wipe blood off of Conlan, but that was probably Nikitin’s blood. In the waning seconds of the first round, the Russian appeared to me to land successive blows to Conlan’s head – six or seven maybe, to which Conlan replied with a right. The announcer described it this way: “Attempts from Nikitin not really scoring, and Conlan comes across with a right and another.” The “another” was blocked by Niktin’s glove in my view. As the round ended, the announcer said, “It’ll be very interesting to see what the judges are scoring. Will they be looking for the aggression or will they be looking for the boxing?” Presumably the announcer meant that Nikitin was making a show of being an aggressor, while Conlan was boxing his way to a first round edge. “I hope the judges are seeing a fair fight here,” the announcer said, almost anticipating the judges to score it in Nikitin’s favor. In the second round, Conlan appeared to be taking the fight to Nikitin, landing far more blows than the Russian. With a minute left in the of the round, the fight was stopped and blood was cleared from Conlan’s nose and Nikitin’s head. When the fight resumed, they came out swinging. And again the fight was stopped to clean up the side of Nikitin’s head. But when they came back out, you could see that Conlan had opened up a new wound as blood streamed from the area of Nikitin’s left eyebrow. At this stage, again with my untrained eyes, I would have to say Conlan won the second round. 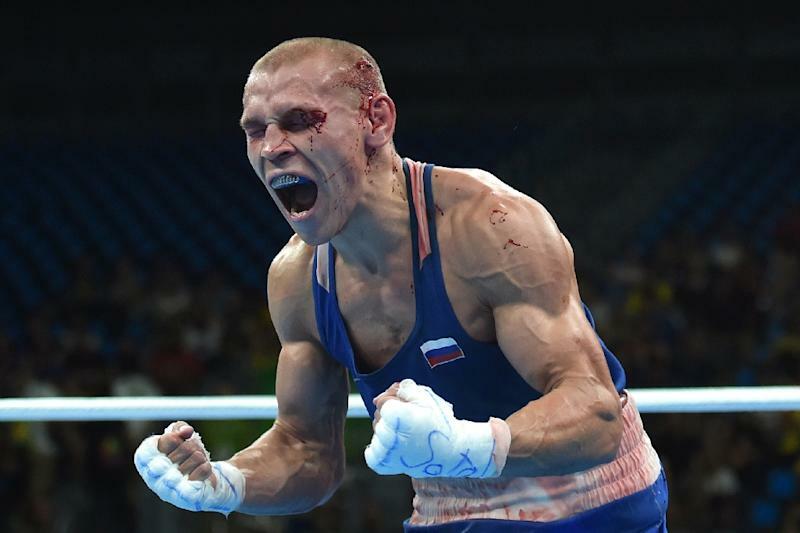 He landed more blows, and there were times when Niktitin looked like he was flailing in the wind. I wouldn’t say Conlan won overwhelmingly, but solidly yes. The judges agreed, each giving the second round to Conlan 10-9. Two-thirds of the way through, the two boxers were tied – even steven. Conlan starts off the third round landing five or six punches as Nikitin kept his blue gloves up around his face, where they had been throughout the entire match. It’s as if the announcers were trying to contain their own anxiety and will Conlan to victory for Ireland, as it turns out, the last boxing hope for Ireland in the Olympics. But in the second half of the final round, the two boxers stood toe to toe, exchanging punches, although to my eyes, Conlan was more aggressive, and landed more frequently. Towards the end, you can see both fighters were exhausted, both landing punches here and there, but no one really establishing any semblance of dominance. As they lined up with the referee, Conlan was looking confident, raising his hand as the voice intoned that the victory was unanimous. As soon as the announcer said, “In the blue corner…” Nikitin dropped to his knees and looked up to the sky in joy. As the referee, still holding the arms of both boxers, twirled them around 360 degrees to display the winner to the entire audience, Conlan probably felt he was being dragged around like a rag doll. The judges from Brazil, Sri Lanka and Poland all scored Nikitin ahead 29-28, which meant that all three judges scored round 3 10-9 in favor of Nikitin. “It’s another shocker,” said the announcer. Was it? OK, I’d give Conlan the edge in round 3, and I believe he should have advanced. But I’m not a boxing expert. I’m only a casual fan of the sport. I grew up adoring Muhammad Ali and Sugar Ray Leonard, admiring their skill, determination and confidence as they ruled as champions. And when I think of Olympic boxing matches absolutely stolen, the benchmark to me is superstar Roy Jones Jr, when he clearly won his bout with Korean Park Si-hun in the light middleweight gold medal match at the 1988 Seoul Olympics, although the judges saw it differently, awarding gold to the Korean. Following recent judging decisions and after carrying out a thorough examination by the relevant commission, AIBA has decided to take immediate and appropriate actions. Since the beginning of the Olympic Games, AIBA has conducted 239 bouts. The AIBA R&J commission has reviewed all decisions and determined that less than a handful of the decisions were not at the level expected and consequently it has been decided in accordance with the AIBA R&J evaluation committee that the concerned referees and judges will no longer officiate at the Rio 2016 Olympic Games. In accordance with AIBA rules the result of all the bouts will stand. Which officials were released was unclear, although it is said six were sent home. And then, a day later, AIBA took action again, announcing that their executive director, Karim Bouzidi, the AIBA leaders on the scene in Rio, was reassigned. Obviously, AIBA has uncovered something unsavory in their officiating ranks. But that is all a bit late for Conlan, He and all of Ireland will fume for a while. And to add insult to injury, the cuts to Nikitin’s head, certainly made worse by Conlan’s heavy rights, forced Nikitin to retire from his medal-round match with American Shakur Stevenson. Stevenson got a free pass to the gold medal match. Posted in Boxing, Rio Olympics and tagged 1988 Seoul Olympics, AIBA, bantamweight, boxing, International Boxing Association, Ireland, Michael Conlan, Park Si-hun, Roy Jones Jr, Russia, Vladimir Niktin. Bookmark the permalink.